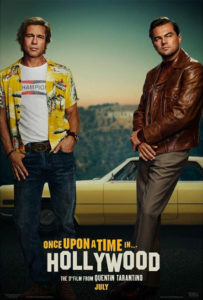 Also released this week is the first poster for the ensemble film, showing Brad Pitt and Leonardo DiCaprio standing in front a car with the Hollywood sign partly featured on the background. The teaser trailer features a collage of the 1969 Hollywood scene and introduces the main characters, including Bruce Lee who is shown on a film set seemingly choreographing a fight scene. The film follows Rick Dalton (played by DiCaprio), the former star of a Western TV series, and his longtime stunt double Cliff Booth (Pitt), who are struggling to make it in a Hollywood they don’t recognize anymore. Margot Robbie is set to portray actress Sharon Tate who, along with nine other people, were brutally killed at her home by Charles Manson’s cult followers. Also in the ensemble cast are James Marsden, Al Pacino, Burt Reynolds, Damian Lewis, Julia Butters, Luke Perry, Clifton Collins Jr., Emile Hirsch, Dakota Fanning, Keith Jefferson, and Nicholas Hammond. “Once Upon a Time in Hollywood’ hits theaters July 26, 2019. This entry was posted in Entertainment, Movie Trailers, Movies by admin. Bookmark the permalink.